I like to play along with Freshly Made Sketches as often as possible. 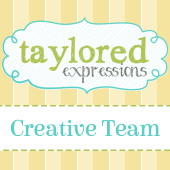 They have a requirement that the card be "clean" - not necessarily simple - and that is exactly my style. With this week's sketch, I pictured Christmas ornaments. 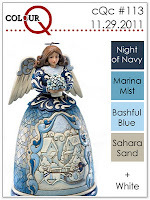 Then I decided to go a unique direction and pair it withe blues in this week's colourQ challenge. That's when things started getting out of control!! Wouldn't the background look nice with some white, sparkly spritz. Then I should sponge the edges. 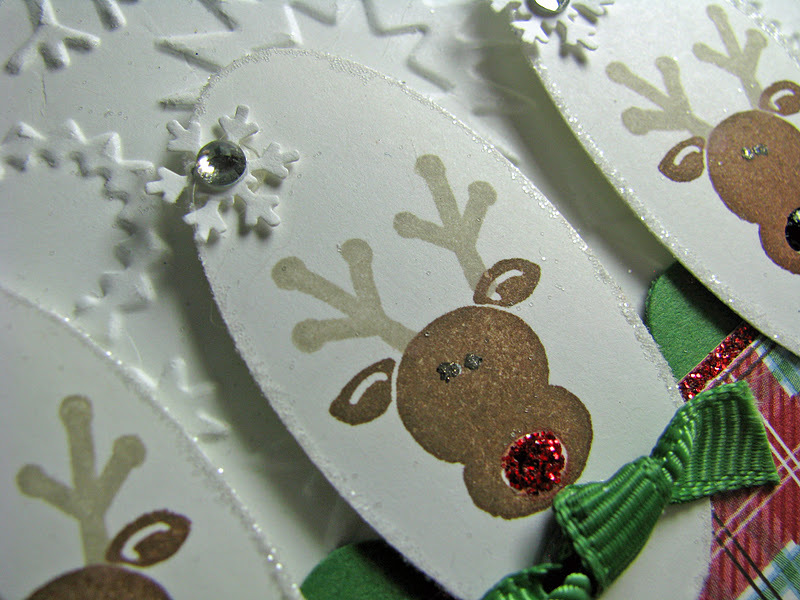 Then I needed to add some glitter to the top of each ornament because of the snow. And pretty soon this card was out of my personal definition of "clean"! But I LOVE it - it's one of my favorite Christmas cards this year. I spritzed it with Mr. Huey's sprays - both Calico White and Calico Shine. An entirely different look, isn't it?? The reindeer is from an old Stampin' Up set called Holiday Sampler. 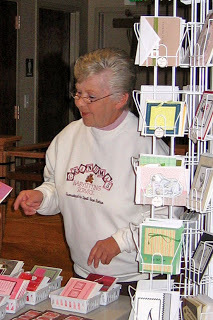 I found it when I was rummaging around for a sentiment for the first card - it was literally dusty!! So I simply had to use it. I ran a glue pen around the edge of each piece and dipped it glitter for a subtle shine. Of course, any one who dislikes sketch challenges is obviously wrong...but it's OK that I really dislike inspiration challenges!! Both cards are gorgeous! The blue ornaments are beautiful with all the sparkle...those reindeer are the cutest paired with the Frostwood lodge dsp...wish that stamp was still around!! THanks for joining Freshly Made Sketches! I say both cards qualify! Your first one is absolutely gorgeous and the second is absolutely adorable! You have such a flair! I can't decide which card I like more! I love the glam and glitter on the first one and the adorable sweetness on the second. And I agree with Linda that both cards qualify! Thanks for joining us at Freshly Made Sketches! Oh my gosh! From extremely elegant to extremely adorable, both are incredibly talented cards! Thanks for sharing these with us at Freshly Made Sketches this week! Both cards are fantastic! I'm in love with those adorable reindeer. 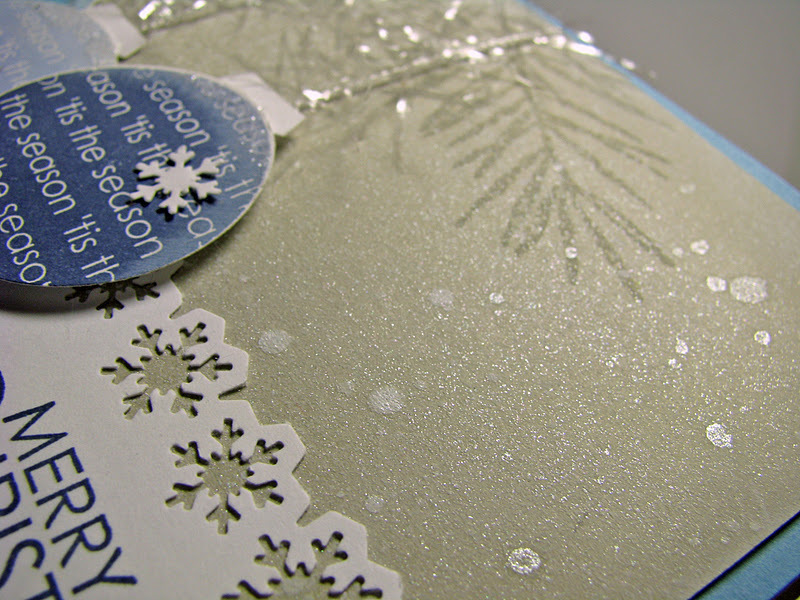 Love that embossed background too. I'm new to sketch challenges but I'm really liking them. So far I've only done scrapbook layout sketches. Need to get busy with some card sketches. TFS. Clean or not, I LOVE your ornament card! That is the BEST one of all the submissions at Colour Q ! Happy holidays and thanks for sharing! Wow .... your cards are just beautiful ... love the elegance and sparkle of the blues and I love the cuteness and whimsical of the reindeers ... both are fabulous and perfect! Love those wee snowflakes with the reindeer Kim! Both cards are awesome! You could enter the first one too!! Thanks for joining us this week at Freshly Made Sketches!!! I love how you showed the flexibility of a sketch in one post! It always amazes me how many interpretations there can be! Both of these are fantastic! So glad you joined us (twice) at Freshly Made Sketches this week! Two completely different takes on the sketch, and both turned out beautifully! The sparkle and tinsel on the first card are absolutely lovely--I can see why it's one of your favorites. Thanks for joining us again this week at the ColourQ! Both cards are stunning, I would say that both cards qualify for FMS. I love your first card - it's so elegant with the colors you used and the shimmer. 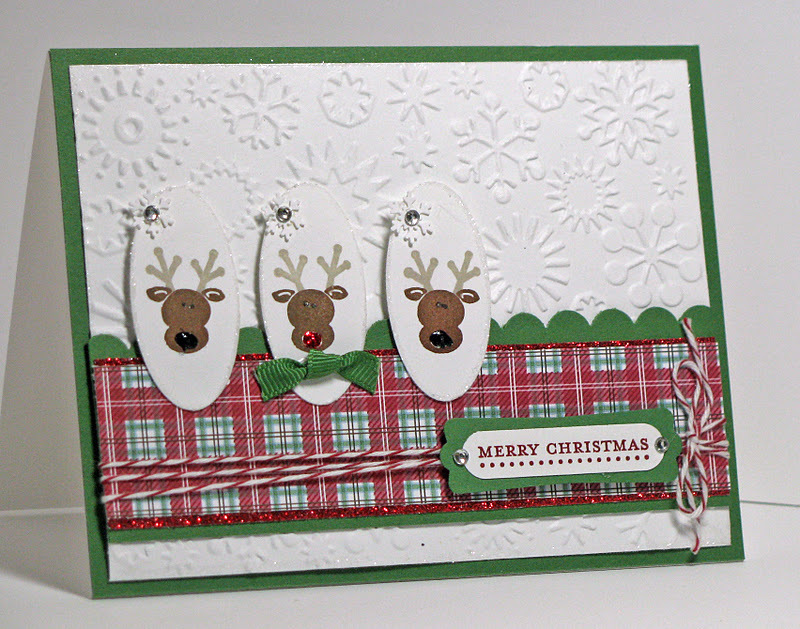 Your second card is gorgeous as well with the cute reindeer and the accents you added with the twine and glitz! Thanks for playing along with Freshly Made Sketches! 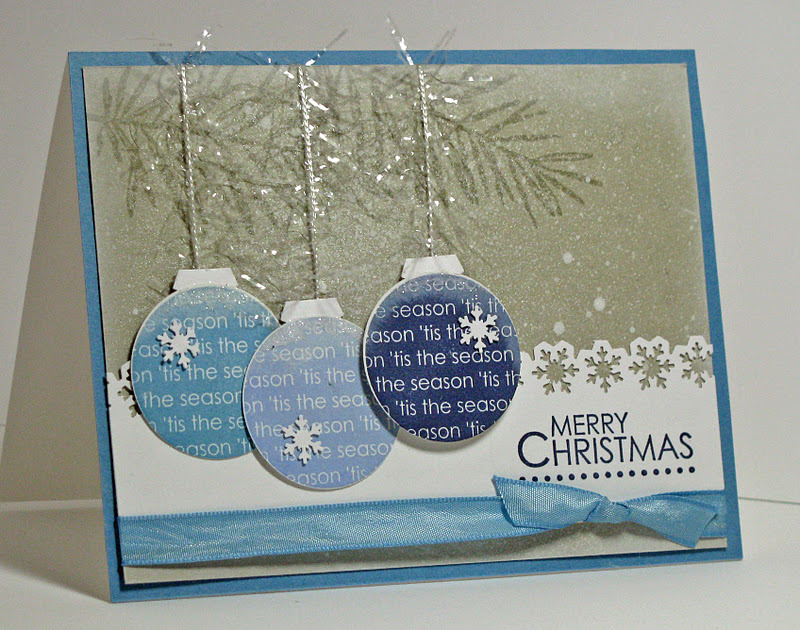 Both gorgeous cards :) :) :) But the baubles would have to be my fav too! Oh my goodness....these are both absolutely SWEET!!! Not "limiting" at all---you really rocked the sketch as well as the CQC challenge! LOVE it! Kim, they are both awesome! I love the colors and sparkle of the first and the clean lines of the second one. One is elegant while the other is fun! Thanks so much for joining us at Freshly Made Sketches! Always love your gorgeous cards, Kim!!! Thanks so much for playing at the colourQ this week & congrats and being named a colourQueen!!! Oh Kim..I didn't get round to see this card and now it's won at ColourQ...not surprised, it's brilliant:) So sparkly and pretty, love the subtle boughs too. 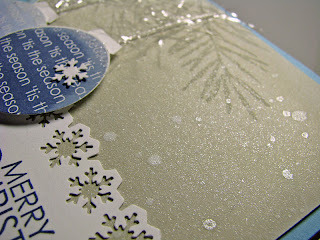 When I saw your ornament card in my blog reader the other day I said to myself that it was a definite winner - and it is! Congrats on being Colour Queen! I'm not a sketch fan but not because I think they're limiting. They just stress me out for some reason! Less Is More: One Word and One Word Only!! Freshly Made Sketches: Merry Snowflake!